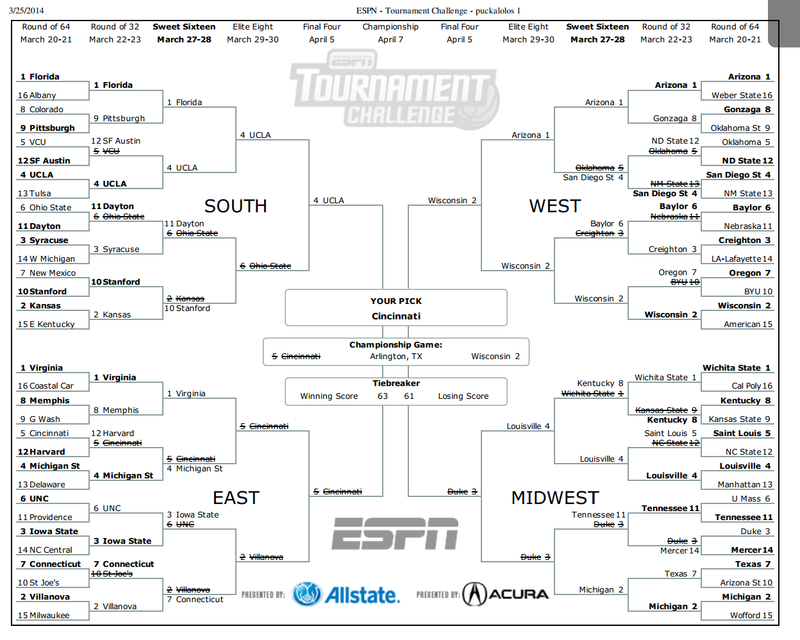 An update on our unofficial Source bracket — now ranked as 9.5 millionth best at ESPN. We’ll do even better next weekend! (Go Bruins). The auto manufacturer in February issued a recall for 1.6 million Cobalts and other small vehicles, five years after it apparently knew about a flaw involving an ignition switch that could cause vehicles to suddenly lose power and the ability to deploy airbags, reports the Times. There have been 23 accidents involving 26 fatalities since 2009 involving those vehicles, with some of those accidents possibly tied to the faulty switch. G.M. does not directly dispute the NYT but says that it has evidence of 12 deaths tied to the switch problem, with the accidents all occurring in 2009 or earlier. In recent weeks, the parents of Benjamin Hair, the 20-year-old from Virginia killed in December 2009, received a postcard from G.M. announcing the recall. It was one of dozens of letters about their son’s car that the company has sent since the crash. The operator of a train that failed to stop at the end-of-the-line at O’Hare may have fallen asleep before the train jumped across the platform and climbed escalator stairs early Monday, according to officials. More than 30 were hurt in the crash, although none were life-threatening injuries. In the meantime, the airport’s rail station remains closed and passengers are taking a bus shuttle between the airport and the second-to-last stop on the CTA’s Blue Line. Staff are seeking the OK from the City Council to perform the kind of work that would accompany a closure of the airport in 2015– i.e. how to zone the land, studying what kind of environmental cleanup may be needed. Keep in mind that the city HAS NOT made a decision to close the airport and resistance from pilots, plane owners and the FAA would almost certainly follow. Nonetheless, interesting to see the city may soon begin mulling what other uses may be possible on the land, which is a little more than a mile south of the future Expo Line station at Exposition and Bundy. The Weekly gives the edge to Ballona Creek based on scenery, safety, destinations and other factors. I’ve ridden the path between the Expo Line’s La Cienega Station and Marina del Rey. It’s interesting, that’s for sure — and it’s very isolated from street life or anything else around it until you reach the Marina. The L.A. River path is interesting through the Glendale Narrows although it’s often freeway adjacent and it doesn’t directly connect to DTLA at its southern end. My three cents: both bike paths could use some work. A recent study partially funded by NASA made news for predicting the collapse of civilization in a resource-depleted world. That leads the Weekly to conclude that getting a bike will greatly help your personal mobility when we’ve run out of fuel and electricity to power cars. Bikes are also relatively easy to repair and may help you quickly escape roving bands of other humans that want to kill you. The agency’s annual “state of the pavement” report finds that 84 percent of the roads it manages in the state are in healthy condition while 16 percent are in “poor” condition. In the Los Angeles region, 35 percent of freeway lanes are in poor condition.